Homemade pizza crust with BBQ sauce, ranch, and LOTSA bacon. Your soon-to-be all-time favorite pizza, perfect for game day... or any other day! Aldi use to keep a pizza like this one in stock, and we were OBSESSED. I could have seriously eaten it for every meal and never been done. But in recent months, it's unfortunately disappeared from their shelves (at least in our area anyway). I'm hoping this is just a temporary condition, but in the meantime we needed a replacement in our house STAT! So we started making this homemade version of their Bacon Extreme Pizza, and it is fantastic. The star ingredient is the BBQ ranch sauce. 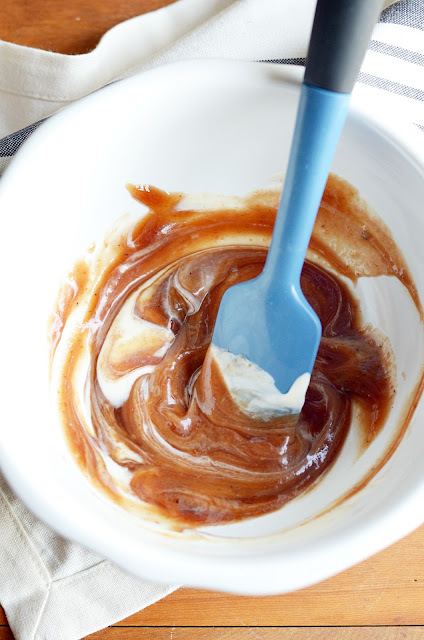 And it couldn't be easier to make-- you'll just need equal parts of your favorite BBQ sauce (we always use Sweet Baby Ray's) and ranch dressing (we use Hidden Valley). Mix them up, and voila! 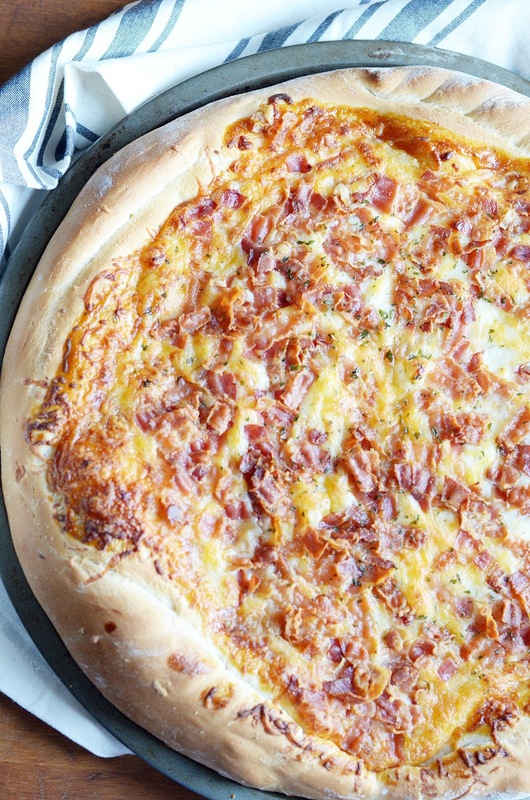 Spread that on top of my favorite homemade crust (it's ridiculously easy, you guys), top it with LOTS of mozzarella and cheddar, and of course, an insane amount of chopped bacon. It's the perfect balance of sweet and savory with a thick, chewy texture you won't be able to get enough of. Preheat oven to 425ºF. Press the pizza dough onto a greased or well-floured pizza pan. Use a fork to prick holes all over the dough. Mix together the BBQ sauce and the ranch dressing, and spread mixture over the dough. Spread the cheddar over the sauce. Next, add the bacon on top of the cheddar layer. Top with the mozzarella cheese and Italian Seasoning. Bake for 15-20 minutes. Crust should be golden and the cheese should be melted and bubbling. Let cool for a few minutes before slicing and serving. You'll need this recipe for the crust. 1 recipe = 1 pizza crust.